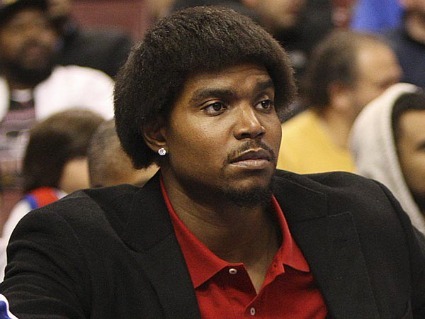 Bynum brings talent and Moe Howard 'do to Cleveland. Andrew Bynum has been in the news for all the wrong reasons over the last year. The former All-Star center missed every single second of floor time while a member of the Philadelphia 76ers last year. Before the start of the 2012-13 season, there were reports that he did additional damage to his already shoddy knees while bowling. In May, he took his dual bone bruises to Spain, where he was taped dancing the flamenco. The words "lazy" and "overpaid" have been used to describe the 7-footer. If Bynum wants to get (over)paid in Cleveland, he's going to have to overcome his slovenly reputation, as your Cavaliers have reportedly signed him to a two-year, $24-million deal, with just $6 million guaranteed. Every piece written about the 25-year-old is going be a cost-benefit analysis of bringing the enigmatic big man into town. So let's get the risks out of the way first. Outside of his health, the arguably more dangerous impact of a Bad Bynum is the effect he has on the locker room. The Cavs are a young team with a new-old coach. Bynum, if he's not properly motivated to chase that incentive-laden contract of his, could be a poison pill that taints the franchise's long-term rebuilding plans. Last year, the Cavs' chemistry, especially on defense, was as fragile as Bynum's knees. If he arrives hurt and unmotivated the team could be sunk even before the season starts. Let's say Bynum comes into camp with a file full of newspaper clippings questioning his work ethic and hair-do. The unkind words of these "haters," as is the parlance of the times, inspires him to replicate the 19 point, 12 rebound year he had in 2011-12, coincidentally a season played under his new-old coach Mike Brown. Fantasize with me if you will about Bynum working in tandem with an equally healthy and motivated All-Star point guard, the latter feeding the former for easy baskets around the rim, a weapon the Cavaliers' arsenal hasn't carried in ages beyond telling. Match him up with a non-injured hustle machine who can now concentrate on rebounding and defense, or a young power forward developing his own offensive skill set, and the Cavs' bigs suddenly become a strength rather than the weakness they were perceived to be after the recent NBA draft. Daydreaming is fun, but the reality of supercharging what has been a frozen molasses rebuild is much more exciting to consider. If everything falls right health-wise, (a big if, granted) these Cavs could be a middle-tier playoff team, which would be tremendous for fans while also making Cleveland a more enticing place for a prized small forward set to become a free agent in summer 2014....a certain individual by the name of PAUL GEORGE. Such are the blue-sky castle-buildings of a big free agent signing in Cleveland. Bynum may not play a minute for the Cavs. He may transform the locker room into his own personal radioactive zone. But how about we ditch the worst-case disaster planning for another time and think on what could be? There is no reward without risk, and the potential for an enjoyable season or three of Cavs' basketball is a dice-roll worth taking.